As part of Japan Cuts 20126 day long look at Sion Sono they are going to be running one of his most deliriously wonderful films PEACE AND LOVE. 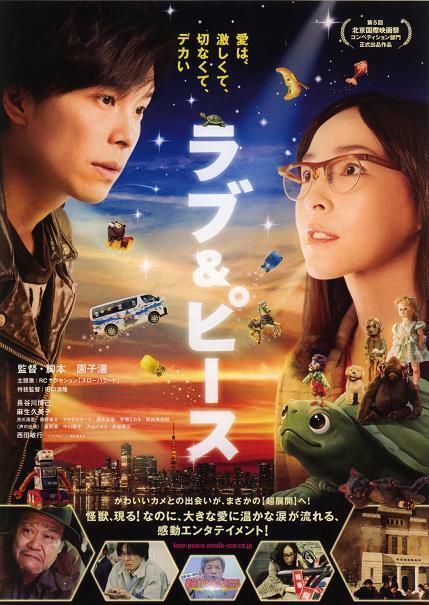 The story of a boy, a girl and a magic turtle is just wondrous beyond words and is a must see regardless of who you are. I saw the film at the Ithica International Fantatic Film festival and it blew me away. Go see it Saturday at the Japan Society and be equally rocked- in a happy way. Ryo is a salary man who is greatly put upon by life. Once an almost rock star he now works in an office. He likes a mousy girl in his office but has no idea if she feels the same When his turtle gets flushed down the toilet he is consumed with guilt. But the turtle suddenly can grant Ryo's wishes-with the price of his growing to a size equal to the desire in the wish. Sheer movie magic of the sort that only Sion Sono can manage. Sono is one of the greatest directors working today and his ability to make subjects like this work is amazing.Actually that he can bounce between subjects and genres is the amazing part- there seems nothing he can't do from hip hop musical (TOKYO TRIBE) to mad killer movie (COLD FISH) to quiet meditative film inspired by his dad (BE SURE TO SHARE) he can do it all and do it well. When he makes a film I never question what it is I simply try to see it because it's something special. I have no idea where to start with this film and I'm not going to try. I'm simply going to say go find a copy and see the wonders for yourself.